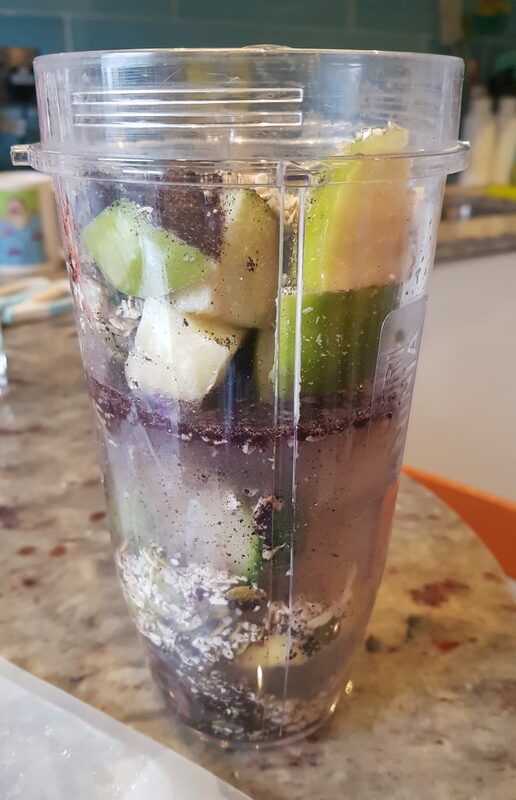 Smoothies are an easy and tasty way to get your fruit and vegetables in, but often there just isn’t time in a busy day to do all the required washing, peeling, and chopping, not to mention figuring out what tastes good. 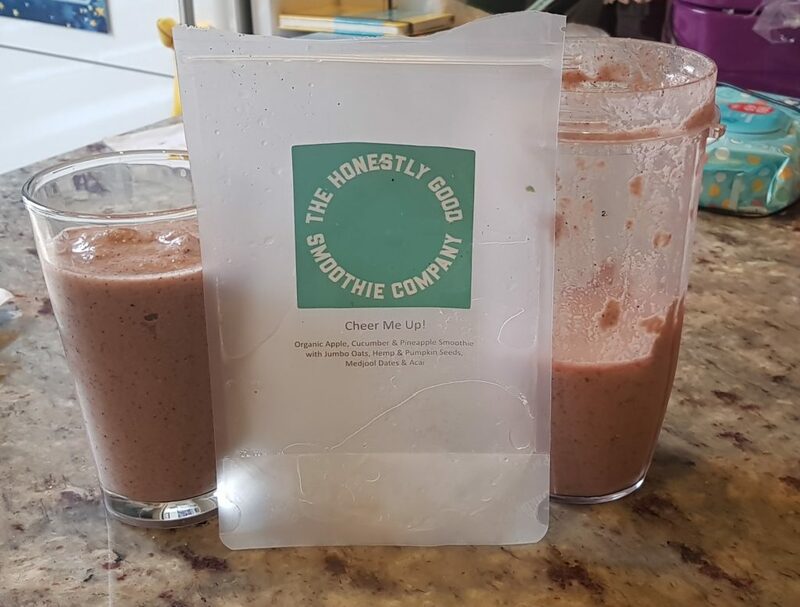 The Honestly Good Smoothie Company aims to provide individual smoothie pouch kits, frozen for complete convenience, that are tasty, packed with superfoods, organic, and taste delicious! 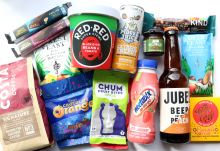 You can order 5 or ten pouches at a time, weekly, fortnightly, or monthly, costing from £4.75 per kit including delivery. There are several categories: Fruity, Green, Protein, and Veggie. You can choose a mixture to find out what you like, or go with a category. They are also very responsive to communication so you can contact them with any particular preferences and they’ll do their best to help. 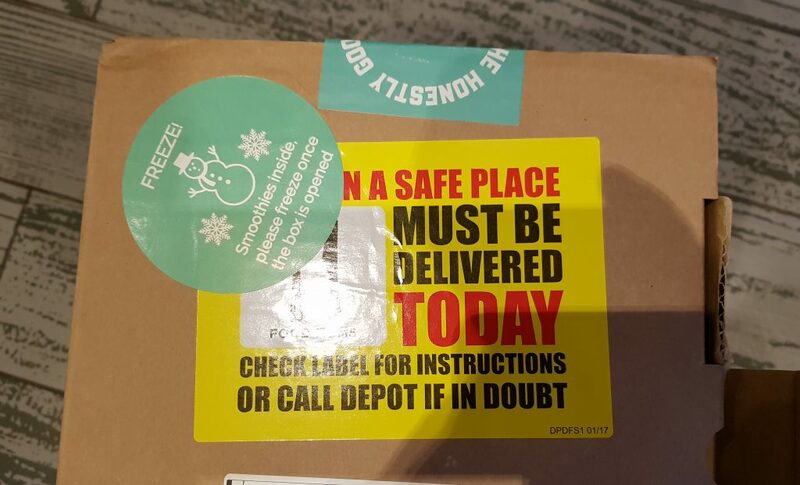 The pouches are frozen, but they’re sent in some very clever packaging that will keep them frozen even of you’re not at home to take delivery right away. 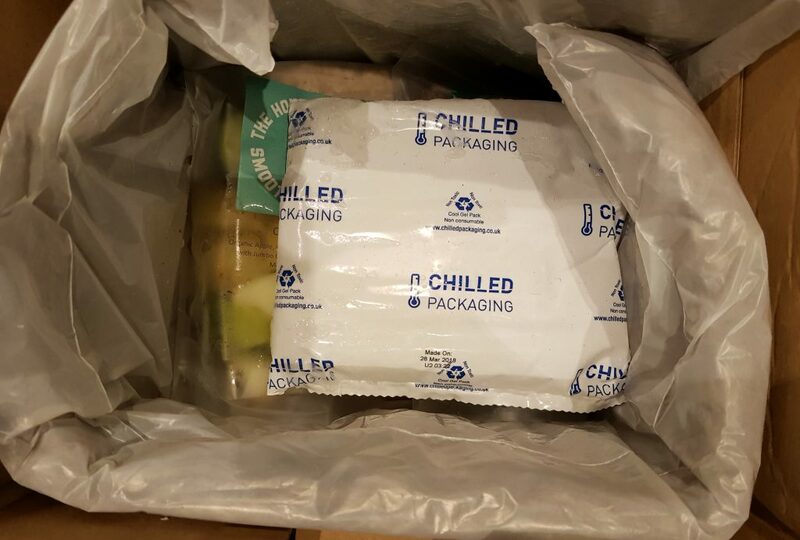 On top is a frozen pack, and around the inside of the box is special insulating material. This is made from wool, and is recyclable and reusable. 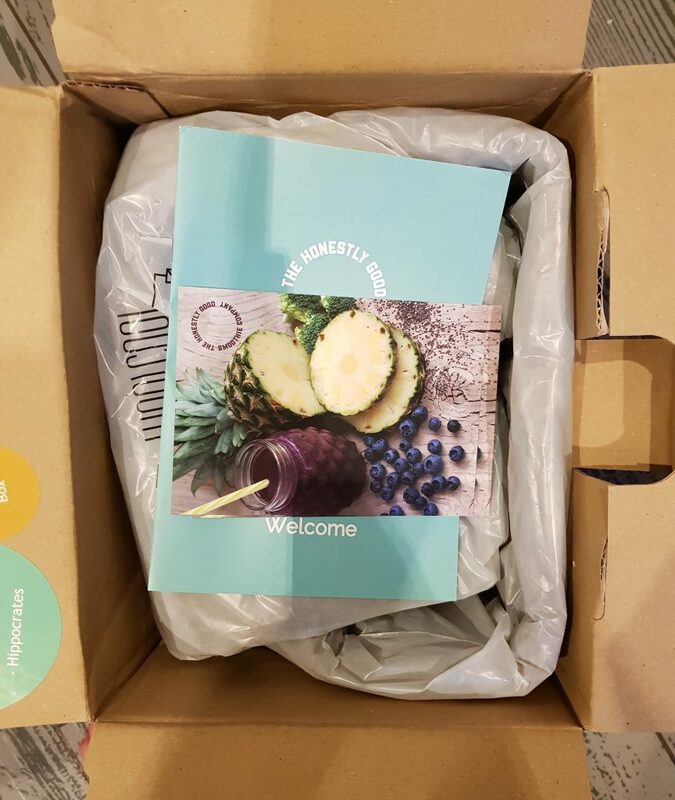 The company will give you a bag for you to send this packing material back to them (free) so they can use it again. Very eco-friendly! 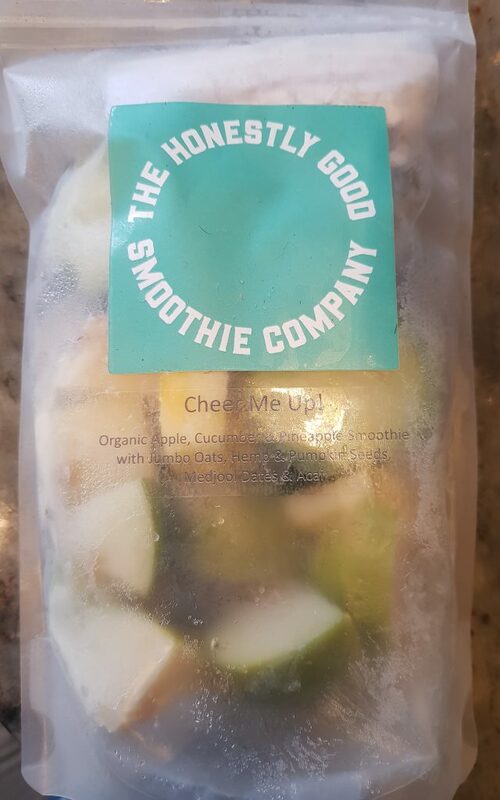 Cheer Me Up – Organic apple, cucumber, pineapple, with jumbo oats, hemp, & pumpkin seeds, medjool dates & Acai. Green Clean Protein – tofu, white grapes, broccoli florets, garden peas, curly kale, pea protein, milled flax seeds and Spirulina. Mai Chai – Organic cauliflower, banana, sweet potato, medjool dates, stem ginger, cashews, sunflower seeds, hempseeds, cacao nibs, & chai spice. The Fitness Fuel One – Organic tofu, banana, cannellini bean, apples, roasted peanuts, dates, hemp seeds, and lucuma. The Happy Hemp One – Organic cucumber, mango, white grapes, spinach, lime, hemp seeds, sunflower seeds, and almonds. They all work the same way. Store the pouches in the freezer, then when you want one, pull it out of the freezer and empty the contents into your blender. Add around 300ml of whatever liquid you like, let it stand for a few moments to soften slightly, then blend. This is Cheer Me Up. The jumbo oats, hemp, & pumpkin seeds, medjool dates & Acai came in a little separate package. You can use pretty much any liquid you like, milk of any kind, juice, whatever. I decided to use water because that’s usually what I use for smoothies. I know it doesn’t look appetizing like this, but it’s all going to be blended! Milk or milk substitutes add some extra creaminess if you prefer. I’ve got a Ninja blender that is fairly good with frozen stuff. I only let it sit a minute or so, and it was fine, but if your blender is slightly less powerful then best to give it a few more minutes. Each smoothie pouch is supposed to give you around a pint of smoothie. 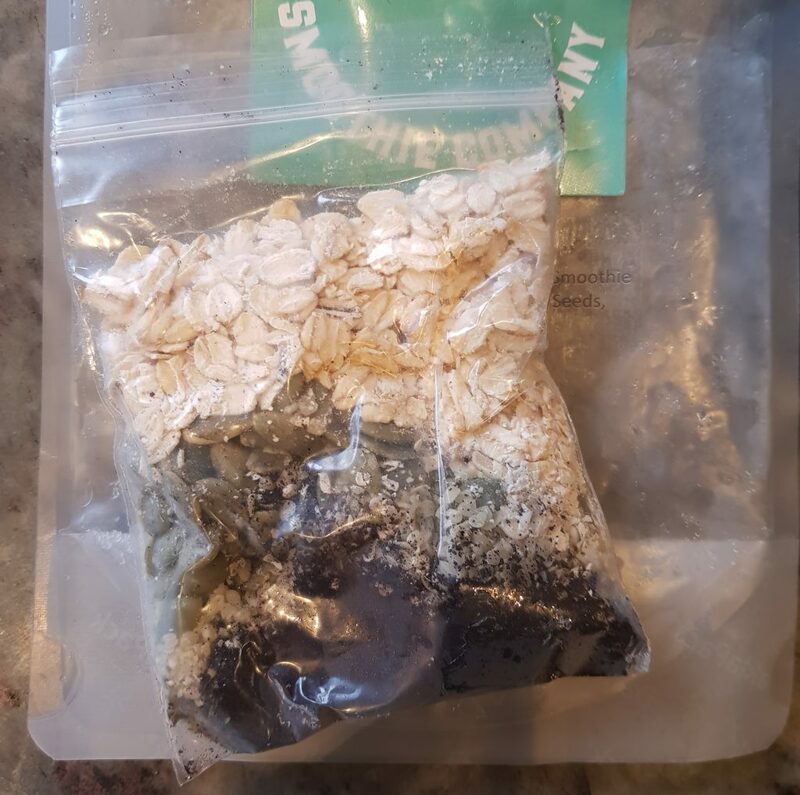 I ended up adding a little more liquid, as I think the oats soaked up more water than other recipes would. It was still pretty thick though. The glass on the left is a little under a pint, so in total I think I ended up with around a pint and perhaps an extra third. Plenty to fill you up! I love smoothies that aren’t too sweet, and this one definitely fitted the bill. Adding milk of some kind would have definitely added a little more sweetness and probably worked better with the oats, but for me it was just fine as it was. I especially like green smoothies, so the Clean Green was perfect , nice and fresh-tasting. 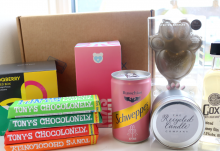 All the ingredients are organic, and wherever possible are sourced from British producers. I’m really glad for the organic aspect, as I try to buy organic whenever I can, so this is a great way to make sure this continues. 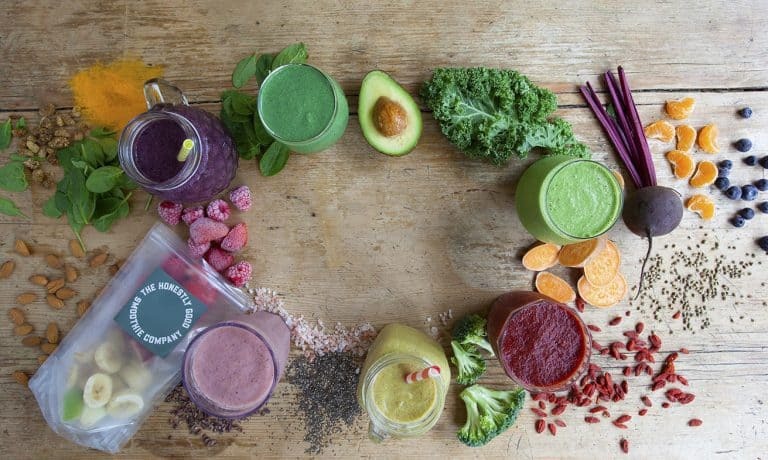 The smoothies are filling enough to keep you going for a plenty of time, and keep your fibre intake up too! My favorite thing is that it is so fast. Grab a pouch from the freezer, throw it into the blender with some liquid, and I figured out that the perfect time to leave it to soften slightly was the time it took me to have a cup of coffee. In the morning you could also leave it while you’re in the shower, and blend, which only takes 30 seconds or so. Easy! At £4.75 per smoothie it’s not inexpensive. However the price per impressively large smoothie is similar to what you would expect to pay in a juice bar, and having done a little research, a those bars do not necessarily offer organic options, nor do they necessarily include the superfood boost extras that are included with these smoothies. So for what you are getting the value is really pretty good! 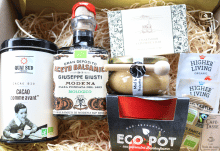 This is not a cheap service, but you do get a delicious, organic, impressively convenient as well as eco-friendly product. It's the most convenient way to get more fresh fruit and vegetables into your diet, as well as some terrific nutritional boosts. 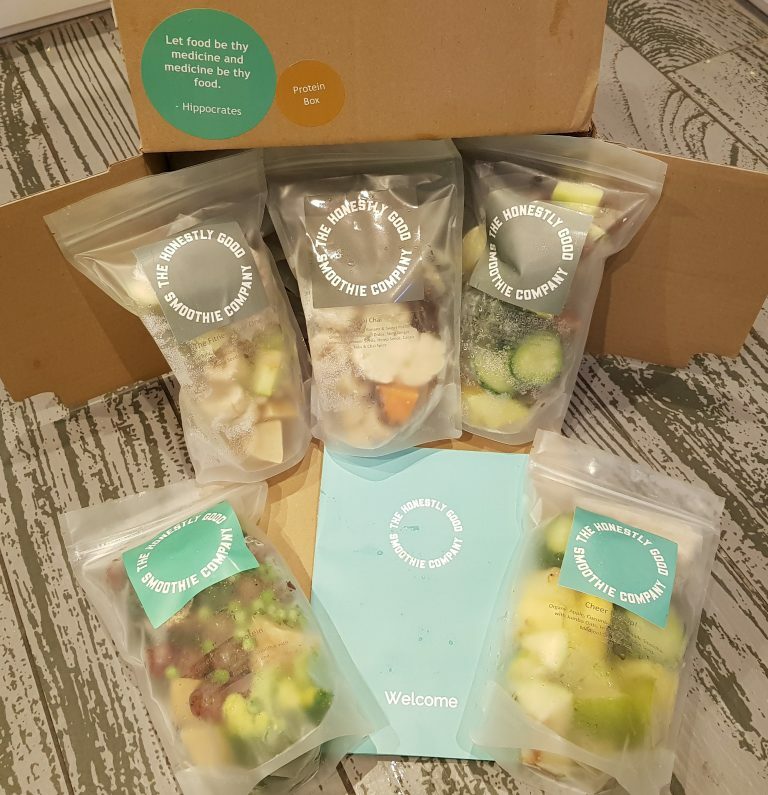 Great to support your New Year's resolution to eat more healthy food!